WELCOME TO THE WEBSITE OF THE CHRIST-CENTERED LIFE. 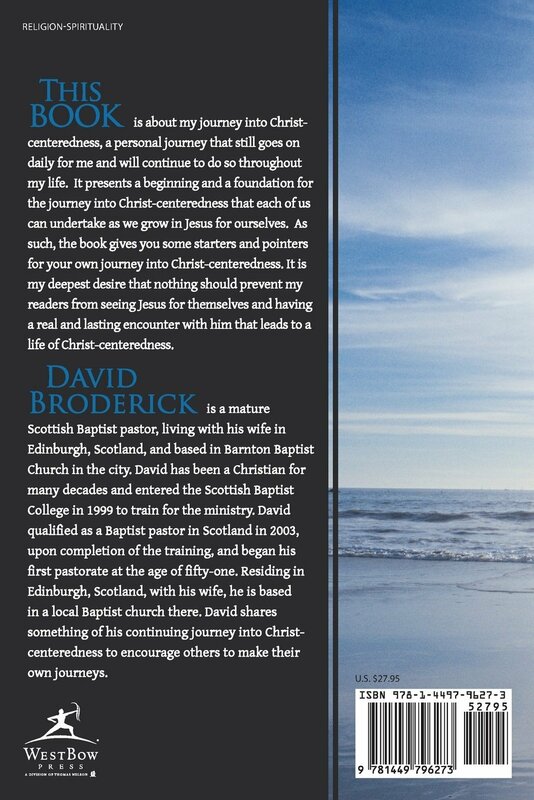 My name is David Broderick and I am a Scottish Baptist pastor and author. I live in Edinburgh, Scotland, where I am based in City Gates Baptist Church and you can get more information about City Gates Church from their own website. The City Gates Church building is above the shops on Whitehouse Road, near Barnton Cross, in the north west of Edinburgh. The Christ-Centered Life website is presented in a high contrast and easy-to-read color scheme but, should particular pages be difficult to read, please let me know through the ‘Contact’ page and I will amend the page or pages on the site. I want the site to be as accessible as it possibly can be, and your thoughts and suggestions are always welcome. You can read what Christ-centeredness is all about under the “ABOUT” tab at the top of the page. There is also a page under the “ABOUT” tab in which I briefly speak about my own journey to Christ-centeredness. The “ABOUT” tab also contains a lot of information and photographs from an astonishing holiday that I had in Malonne, Belgium, in 1985. There is a lot of content of varying style on this website and more content is being added on a regular basis, especially on the pages under the “RESOURCES” tab, and on the “SPOKEN WORD” page (under the “MEDIA” tab) where you can listen to recordings of teaching. On this website, you can also read about people who are involved in or connected to the Christ-Centered Life ministry in one way or another. The “PEOPLE” section will be expanding as others are welcomed to the “Christ-Centered Life” website under the “Christ-Centered Life” banner. Please explore the Christ-Centered Life website and you can contact me if you wish to respond by making comments or asking questions. You can also email me directly at david.broderick@thechrist-centeredlife.com if you wish to use your own email client. Once again, you are welcome here, and thank you for visiting the Christ-Centered Life website today. My first published book, ‘The Christ-Centered Life: Deep Calls To Deep” tells of how I began the journey to becoming Christ-centered, and how I then came to live life every day from the Christ-centered worldview. It is a worldview that recognizes, understands and embraces the Jewish foundation of the Christian faith, and seeks to translate that foundation into a life of faith for Gentiles like myself. The Christ-Centered Life proclaims that Jesus the Christ is indeed the Lord who reigns supreme, despite what may appear to be to the contrary as we look around the world. God reigns and his will shall prevail at the end of this world. In the meantime, an intimate relationship with the Creator God through Jesus the Christ is for everyone – regardless of age, education, color, creed, or any other label that may be used to differentiate between human beings. No-one is excluded from knowing God intimately for themselves. Yet our society has tainted the word “intimacy” with sexuality and, in so doing, has caused church to show an external and a detached religion to the world, while leaving intimacy to the world of sexuality. Yet it was never meant to be that way. We need everything that God has given to us in Christ, and we need to know how to use what he has given us. Most of all, we need to know how to know the Son of God in intimacy. That is why deep calls to deep. “The Christ-Centered Life: Deep Calls To Deep” presents a radically different way to live than many Christians will have experienced. The book will certainly challenge your long-held ways of thinking, it will certainly shake your established patterns of believing, and it will certainly question your cherished methods of doing. Above all, it will teach you never to assume anything, but rather to explore for yourself. Deep surely calls to deep in these days. Hear the call to a deeper and more intimate relationship with God in Christ for you personally. If you yearn for that deeper experience of the knowing Christ, this book will will help you to grow (and go on growing) into that deeper relationship with him as you grow (and go on growing) to see and know God from a Christ-centered perspective. On this website you can also read about my own journey from pastor to published author and you can know something of my own life journey as I came to self-publish “The Christ-Centered Life: Deep Calls To Deep” in 2013 in order to bring the first of my Christ-centered material to a world-wide audience who could then access that teaching without the need to travel to meetings. More of my verbal wanderings. This section contains images and information on books that I have written or that I feature. The media section contains links to various audio recordings, photographs, pictures, etc. This section contains links that take you to various external sites that that I recommend.